Nose: On the nose we have sweet notes of sherry, raisins, and Demerara sugar. Vanilla and icing sugar arrive with cinnamon and a subtle nuttiness. Somehow restrained but quite appealing. Palate: Lovely but again restrained sweetness on the palate with sherry, brown sugar, raisins, plums and dates. Notes of caramel emerge, followed by a slightly warming spiciness of cinnamon, nutmeg, oak and a hint of pepper. Finish: The finish is slightly warm showing medium length. Gentle spiciness, nicely mixed with hazelnut and dry oak on the tail. With water: Water tames a bit of the sherry sweetness bringing more dark fruits such as cherries and plums to the fore. Significantly spicy on the palate with black pepper, ginger and oak, followed by sticky plums and cherries. The finish is medium long with creamy plum jam, followed by dry and spicy oak on the tail. Comments: A nice and palatable single malt. Good balance of sweetness and spiciness. However, compared to the 15yo PX finish less sherry influence here. Not entirely complex but savoury neat as well as diluted. A relaxing dram, no more no less. I thank Volkmar Weber from Whisky Tempel for the photograph. Nose: Sweet and intense with caramel and a fruity backbone of gooseberry, melon, and physalis. This is accompanied by delicate notes of vanilla and acacia honey. Rum flavours linger with tender spiced oak and hazelnut in the back. Palate: Smooth and creamy with vanilla sweetness, toffee and a massive load of spices - black pepper, cinnamon and tannic oak. As the spiciness fades away, sticky tropical fruit aroma intermingle with acacia honey, rosehips, and sultanas. Rummy, syrupy with a Finish: The finish is medium long and sweet with a distinct touch of deeper rum notes. Turns quickly into a fairly dry aftertaste with a delicate nuttiness. With water: Clean and fresh on the nose with less fruity flavours. On the palate, however, the fruitiness is very present with lots of tangerines, melons and a significantly tamed spiciness. The finish is medium long and sweet with tender rum notes. 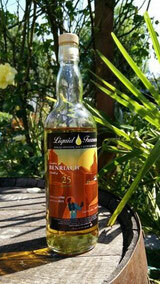 Comments: A cheery dram with lovely toffee and vanilla notes, lingering tropical fruit and sweet rum undertones. The finish works pretty well here as the rum is in a supporting role, putting another layer of delicate flavours on the whisky. A dash of water nicely sweetens the palate. Creamy, rich and very savoury! 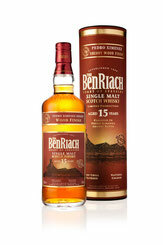 I thank The BenRiach Distillery Co. Ltd. for the photograph. Nose: Delicate aroma of stewed red berries - cranberry, blackcurrant, and strawberry, locked together by a firm peat-smoke catch. Lateron, pleasant fruity notes of plum jam and grape like flavours emerge with hints of chocolate and crisp oak in the back. Palate: Very fruity with sweet barley sugar and delicate wood smoke. Tender notes of dried raisins, sticky plum jam and a slightly bitter touch of orange peel. Warm with a peaty punch, lingering toffee and oak towards the finish. Finish: A very long finish. 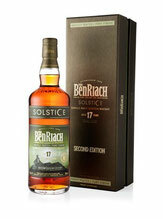 Fruity and smooth with warm oak spices and slightly burning peat. Gently dry with crisp malt and lingering nutty flavours on the tail. With water: Clean and fresh on the nose with flavours of malted barley. The fruitiness is clearly dominated by intense peat and smoke. The delicate fruitiness remains stable on the palate with more nutty flavours coming to the fore. This is all complemented by lingering peat smoke. The finish is long, sweet and dry with slightly warm spices and smouldering wood. Comments: Lovely dram! Amazing the way the port compliments the peat. 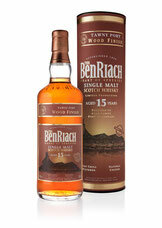 The port has imparted sweetness and delicate fruitiness to the peaty and smoky character of this stylish BenRiach. A superb marriage not often seen in finished whiskies. 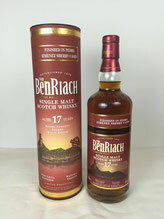 A very enjoyable and recommended malt at a very reasonable price. Well done! Nose: Very aromatic on the nose, Rich port wood notes intermingle with lingering vanilla cream, crème brûlée and butterscotch. Tropical fruits emerge with apricots, peaches and gentle coconut developing into a spicy element with cinnamon, nutmeg and oak. Palate: Rich fruity taste. Grapes, peaches and sultanas, intensely soaked with port, are immediately followed by a massive load of spice - cracked black pepper, even chilli, oak and cinnamon. After the warmth’s fading away, notes of sticky fruit and peach in particular arrive, accompanied by lingering vanilla cream and butterscotch leading to a sweet and creamy finish. Finish: The finish is medium long and sweet at first with sticky fruit and caramel. Turns quickly into a fairly dry aftertaste with pepper and tannic oak. With water: Clean and fresh on the nose with more tropical fruit and red berries coming to the fore. Also very fruity on the palate with a delicate sweetness of fruit, caramel and butterscotch. Water significantly tames the hot spiciness on the midpalate. The finish is medium long and sweet with a moderately dry and spicy aftertaste. Comments: The port wood finish works pretty well. Good balance of fruit, port-derived flavours and the huge spiciness of this beauty, which is pleasantly tamed by a splash of water. This dram certainly benefits from spending some time in the glass before sipping. 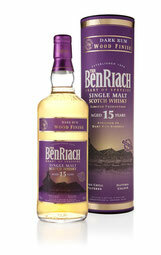 A lovely and rich expression from BenRiach, reasonable priced and highly savoury. Thumbs up! Nose: A sweet and intense nose with huge notes of sherry, raisins, dates, sultanas, and luscious tangerine. Demerara sugar arrives with dark chocolate and a hint of leather. Honey, vanilla notes and gentle hazelnut in the back. Rich, creamy, and fruity. Palate: Creamy with lots of sherry sweetness, mixed with dark chocolate. A spicy explosion at mid palate with cinnamon, cloves, oak, ginger and cracked black pepper. Orange marmalade shines through with a mellow touch of raisins, plums and a slightly bitter edge towards the finish. Round, smooth and very aromatic. Finish: The finish is soft showing medium length. Warming on spices, mainly ginger and pepper. Honey sweetness with tender orange and lingering marzipan on the tail. With water: There's almost no change on the nose with water. Very sweet on the palate with more spices coming through. Warm and delicate. The finish is soft, sweet and medium long with a delicate touch of dark chocolate and a fine nuttiness in the aftertaste. Comments: Nicely smooth for a 15 year old. Lots of character and good balance between the sherry sweetness and the warm spiciness. A dash of water sweetens the palate. A real cheery dram, rich, round and mellow. Not entirely complex, but great value at this price. Very savoury and quaffable. Nose: The nose appears to be fresh with lots of yellow ripe fruit, banana, pear and peach, complemented by delicate herbal aromas such as lovage and sage. There's creamy vanilla coming through, along with a whiff of cold smoke and a delicious touch of fresh mint underneath. Very pleasant nose. Palate: First sweet on the palate with yellow ripe fruit, lots of stewed banana and yellow apples. This is immediately displaced by a huge amount of spice, cracked black pepper, and lots of herbal flavours mixed with a touch of citrus. Fairly mouthfilling with gentle dark honey and a touch of oak coming through. Rich and intense! Finish: Boy, the finish is very long and warm. Oak spice, pepper and herbs coming along with lingering vanilla, toffee and a delicate nuttiness in the end. With water: There's more power on the nose with fruit and a bit more alcohol. The palate stays sweet with a slight decrease of the spiciness and more vanilla coming through. The finish is medium to long with sticky honey and delicate nutty flavours. Comments: A very nice and delicate whisky. Fruity with an impressive balance of spice and herbal flavours. This needs some time to develop its full spectrum of aromas and can be enjoyed either neat of by adding a splash of water. In both cases a pleasant indulgence.